Use this map of Disneyland park to plan your best Disneyland vacation. Wondering where is Disneyland? Disneyland resort, and its sister park California Adventure, is located in Anaheim, California, near Los Angeles in southern California. We can show you better where it is on a google map along with other California attractions, and also have an aerial view of the park. If you are flying to your Disneyland California vacation, the closest airport is the Orange County Santa Ana (SNA) (John Wayne Airport) . This airport is popular for local flights and some USA flights. If you are flying across the country or from another country, you will find more flights to and from Los Angeles International Airport (LAX). From either airport you can arrange for a shuttle or rental car to take you to Disneyland Calif.
Disneyland also has other theme parks around the world including Disney World in Florida USA, Hong Kong Disneyland, Tokyo Disneyland, and Disneyland Paris. As this map of Disneyland shows, Disneyland is located right off freeway interstate 5 in Anaheim, California, between the Katella Avenue exit and Ball Road. It is surrounded by many hotels and restaurants, providing many options for your California vacation. 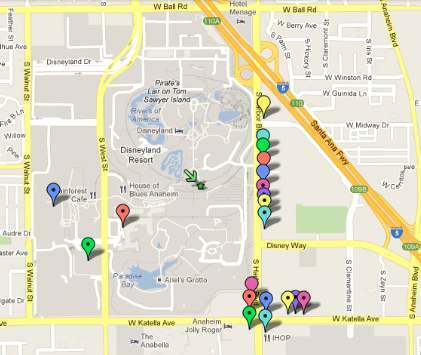 To open this map using google maps to find our more information about each of these hotels near Disneyland, see Google Map of Disneyland Park and Hotels. 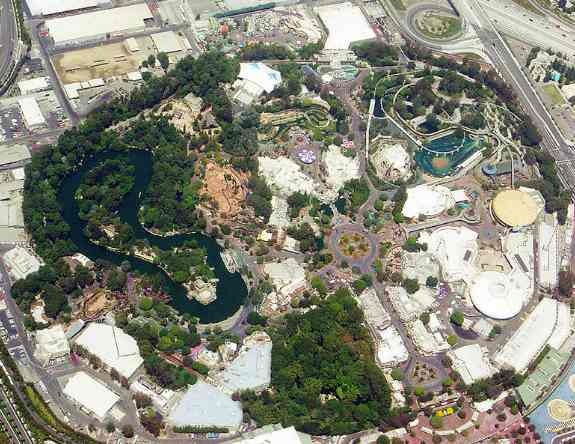 This Disneyland California map is an aerial view of Disneyland park in Anaheim, Calif. Disneyland is divided into different "lands", including Fantasyland, Tomorrowland, Main Street USA, Adventureland, New Orleans Square, Frontierland, Critter Country, and Mickey's Toontown. Disney is currently working on Star Wars Land, which is scheduled to open in 2019. Each land offers a unique experience, which is one reason a trip to Disneyland should be one of your California vacation destinations.